There lies a village, high up in the misty mountains of Nepal, where a doctor performs operations for impoverished children. Two days per week he fixes club feet, twisted spines and fractured arms. The other five days he runs rehabilitation clinics. His name is Dr. Ashok Banskota, and he founded the Hospital and Rehabilitation Centre for Disabled Children (HRDC) outside Kathmandu in 1986. Dr. Banskota knows the realities of life in Nepal. If a patient isn’t able to climb a steep hill, that’s not good enough. He wants them to be able to fully participate in life following surgery. Many of his patients aren’t Nepalese though. They often come from far away carried on the back of a loved one. In the Jewish culture, giving money without your name attached to it is the highest type of giving. Nobody will know you gave to a cause except for you. That way, you’re not doing it for status or for praise. It’s just a good deed that helps others. There’s nothing really wrong with being recognized for good work though. In this case, Dr. Banskota was doing no self-promotion. 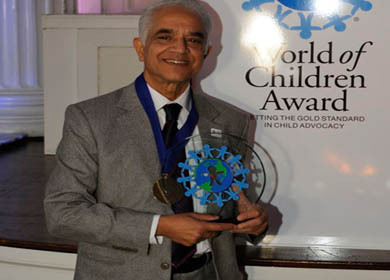 He was discovered by the World of Children organization. They seek out selfless individual to honor. One of the greatest rewards for the work he performs is seeing children outside the clinic playing soccer, something they had never before been physically able to do. Their smiles as they run and kick a ball make it all worth it.